Brake Upgrades and Stopping Power from Viezu The most overlooked tuning upgrade on cars is brakes. With a booming industry of power and bolt on upgrades the brakes are too often than not forgot about leaving the most important safety feature lacking in performance. 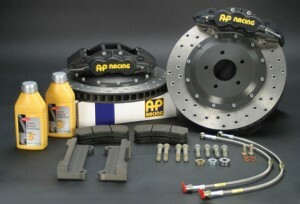 Brake upgrades come in many different forms from outright 2 piece monster 8 pot AP racing setups to a simple brake pad upgrade with everything in between for your budget and driving style. Every car brakes will stop the standard car, but with increased power and even handling characteristics will the brakes stop you the second and even third time after one hard stop Uprated brakes give a much better feel, bite and a much more consistent performance. This option completely bins your original cars brakes and uses 2 piece discs and an all new calliper and braided hoses. This option is the most tailored to you with options on size, disc grooves, calliper piston amount, colour, massive pad option, and brand. 2 Piece discs uses a bell which the disc then bolts on to, this gives the brakes much better cooling and helps to stop the heat being transferred into the cars hub which can then break down the grease in your hub bearings. The calliper is lightweight and contains more pistons than standard callipers (parts of the calliper that apply force to brake) hence giving more of a bite and more clamping force. This type of setup is available for almost any car and is the best option when braking must be at its best. This setup gives the most reliable stopping power with the most consistent performance. The manufactures that we use also supply the complete brake setups for the majority of World Rally, BTCC, Hill Climbing, Clubman, and even classic cars!